Website: Your On It Pimpin !!! Born the youngest of five children in the MIGHTY South Side Projects of Chicago, IL. Mr. Carter learned the art of survival of the fittest at a very early age, and it is a big part of what has forged the CEO of Stunnaz Magazine. Born in Brooklyn, New York the oldest of six children. I grew up in Brownsville, for those who know it is a very rough neighborhood. There is where at a tender age of 9 I grew a love for art. I was introduced to the world of Graffiti, which made me curious and wanting to learn more about drawing. This became the beginning of an aspiring artist. I moved to North Carolina to attend Morehead High School. After High School I entered the Military (Army) for eights years and then released with an Honorary Discharge. I grew an interest in the internet and website development and taught myself some simple and effective web design techniques. I was lacking the skills to make professional graphics to compliment the sites so I decided to attend New York Technical College, where I received my Associate Degree in Graphic Arts. In addition to that I acquired several other certificates from New Horizon in Web design. I have had many opportunities with several companies and influential people by having the knowledge and skills in Graphic Arts. 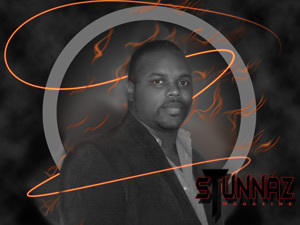 Look at where I am now.. working on Stunnaz Magazine. Wow!! One of the most exciting jobs I ever been on. Solomon and I share the same views on what this magazine should look like inside and out. Here at Stunnaz we want to portray the models as true to life as possible. There is no candy coating here!!! Believe that!